Sixteen-year-old Bianca Monroe is the victim of a terrible curse cast by the evil witch Miss Mabel. The inheritance spell was originally cast on her ailing grandmother. Soon, Bianca’s mother will become ill, then Bianca. Bianca makes it her mission to get close to Miss Mabel to force her to relinquish the curse by whatever means necessary. She has prepared herself for this, but will she really stand a chance against Miss Mabel? I have had my eye on Katie Cross’ Network Series for a while now. The covers were alluring, and the plot enticing. About a month ago, I won both Miss Mabel’s and the sequel Antebellum Awakening in a contest. When they arrived in my mailbox, I immediately started reading. Bianca is a great character full of emotions, but has the resolve that matches that of Katniss Everdeen in The Hunger Games Trilogy instead of the dependent Bella Swann from The Twilight Saga. The difference between Katniss and Bianca however is that the latter isn’t interested in romance. She has once focus, and that is lifting the curse that will eventually kill her and save her mother and grandmother. 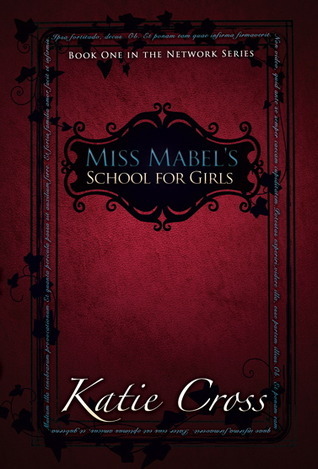 Anyway, Cross doesn’t give Bianca the opportunity to be involved in such affairs, as Miss Mabel’s School for Girls is exactly as it suggests– a school for girls. Boys have their own schools, and one of those is mentioned only once and never really is elaborated on. I believe that such things will be elaborated on the further the series progresses. The world of Antebellum is a unique one, with a seemingly elaborate history, but never goes to deep into it. As stated above, I have a feeling that history is going to be built upon further along in the series, especially since the third book, Mildred’s Resistance, serves as a prequel and will give details on a conflict that ties in with MMSFG‘s story line. On a further note about world-building and fantasy novels, magic almost always comes into play, even if it takes a backseat to the rest of the story. With the majority of the novel taking place in a school where girls go to learn to become witches, magic takes a front seat. A problem some writers have is making that magic believable and not over the top. Cross does this well, leaving the source of the magic a mystery that doesn’t need to be explained if she decides to leave it so. She writes with vivid description, drawing the reader into this strange world. The climax of the novel is breathtaking, and I had a hard time putting it down. Good review…I enjoyed the book a lot too.